In the early 1940s the radiation detectors in general use were gas-filled Geiger-Muller counters, and ionization chambers. These non imaging devices were used to count emissions from samples to estimate absorption, fate and excretion of administered radioactivity before there were imaging devices. The need for imaging was demonstrated by pioneering investigators who moved small shielded hand-held GM tubes step-wise over the neck of patients to record the distribution of normal and abnormally functioning regions in the gland. Originally, they wrote the numerical values of 131I counts sensed by the probe on paper to record the pattern of activity as the detector was moved over a rectangular grid over the neck with notation of anatomic landmark and location of palpable nodules. 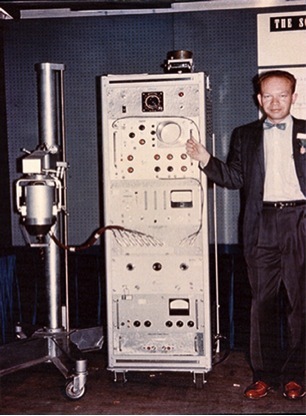 In 1949, Ben Cassen working in Stafford Warren’s UCLA, AEC laboratory, developed the first mechanical radioisotope scanner. Although the sodium iodide crystal scintillator (NaI) had been discovered several years earlier by Hofstader, Cassen used a cadmium tungstate (CdW04) scintillator to a photomultiplier tube. This was attached to a motor driven device that moved the collimated probe in a rectilinear raster over the subject. CdW04 had one advantage over NaI-based scintillators based on its large photo fraction, but suffered from a lower light output. Stafford Warren was a radiologist trained at the University of Rochester and he had held the top health and safety position in the Manhattan Project. He was also involved in the Bikini weapons tests, and the early Japanese A-bomb survivor studies. Like others in key positions in the A-bomb project, he was a strong proponent for nuclear medicine, and helped develop the program at UCLA and elsewhere. Larry Curtiss founded the company that marketed the Curtiss-Wright clinical scanner for a brief time before the Picker company developed and marketed a more advanced device using a NaI (Tl) scintillator in the late 1950s. About the same time, Val Mayneord in the UK also developed an effective radionuclide imaging device. In addition to gamma ray scanning, positron scanners were developed and used in the mid 1950s for imaging positron emitting tracers (PET) in patient and animals. The MGH/MIT group led by Brownell positron scanner used dual opposed probes to image arsenic containing PET tracers in human brain tumor patients. Similar devices were developed and used in Canada and Europe, and innovations rapidly progressed on many fronts. Indeed, the prospects for successful tumor imaging with PET tracers looked very bright from the beginning. High contrast images were obtained in patients with brain tumors using tumor avid radioactive arsenic-labeled compounds. Hal Anger came to the University of California in Berkeley (UCB) in 1946 from Harvard (the Rad Lab), and worked at the Donner Lab until he retired in 1982. The first of his many nuclear-related inventions was the NaI well-crystal detector. It provided increased sensitivity by increasing the geometric coverage of samples contained in test tubes where the sample was inserted into the hole and was surrounded by NaI on all sides. He went on to develop a series of instruments and procedures demonstrating their many imaging applications. The most famous of which is known as The Anger camera. A first task he was assigned was to provide the engineering design and support for the directing the alpha particle beam from Berkeley cyclotron for use in pituitary radiation therapy. In 1952, Anger and Bob Mortimer, another Donner lab medical physicist developed a gamma camera using a Westinghouse image intensifier tube that Russell Morgan had invented for x-ray imaging. The gamma imaging device proved to be too insensitive for clinical imaging and Anger went on and developed a small NaI crystal/PMT camera design that was used for thyroid imaging. The Anger camera was then a working pin-hole collimated device using 7 photomultiplier tubes closely packed on a 4” diameter NaI crystal. Data from the ensemble of photomultiplier tubes (PMTs) were used to read out the signals from the light flashes from energy stopped in the NaI crystal. The x-, y- address and z- energy of each event was decoded by an X-Y-Z summation circuit that became known as the Anger logic. The size of the device was expanded into a larger general purpose imaging device that was used first for gamma rays and shortly thereafter wa adapted for positron imaging. The Anger (Gamma) Camera continues todate as the most widely used gamma ray nuclear medicine clinical imaging device. 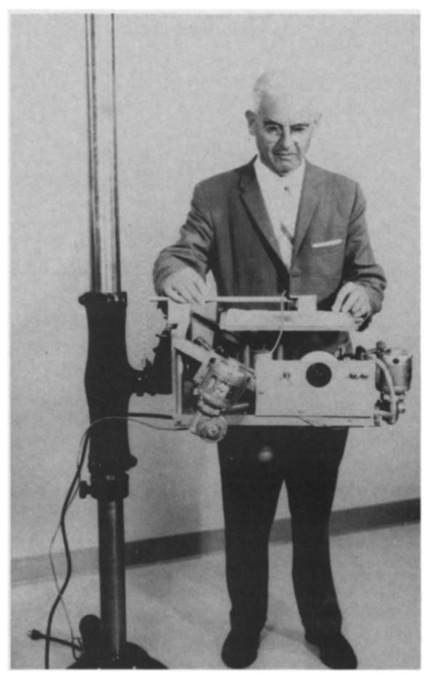 In 1956, while Anger was developing the gamma camera, he designed and built the first multi detector whole body scanner. Bob Mortimer went on and had a distinguished career studying yeast genetics pursuing mechanisms of radiation effects including heavy ions produced by the Bevatron and the HILAC. An acknowledgment of his ground breaking work was his award of the prestigious Beadle prize in Genetics. Bob served as a Dean in the Berkeley Graduate School, and interim Director of the Lawrence Berkeley Lab Genome Project before retiring. Images obtained with the Anger camera were first presented in 1958 at the United Nations Conference on the Peaceful Atom. This generated significant interest for its potential clinical uses. Bill Myers, a nuclear medicine physician/scientist at Ohio State University visited Berkeley frequently, and worked with Anger on a investigative uses of the camera. He was so impressed that he convinced John Kuranz, the President of Nuclear Chicago, to build and market the device. Meyers received the first camera produced in 1962 at Ohio State University. Nuclear Chicago morphed shortly thereafter from a small company known for its multichannel analyzers to be the premier manufacturer of Anger-type Gamma Cameras. The product was an instant hit as it gave practitioners an effective easy-to-use, multi-purpose imaging device that used as the main nuclear medicine imaging device in all countries. An early candidate as an alternative to the Anger camera was the Autofluoroscope mosaic crystal imaging device developed by Merrill Bender and Monte Blau. In Craig Harris’s presentation of their Hevesy award, he noted that Its high data rate capability made it possible to image fast dynamic processes including first pass cardiac studies. Being a stationary device it like the Anger camera was able to correct for motion distortions, not possible with scanning devices. It was well suited to first pass imaging tasks but had a limited range of uses due to its poor energy spectral resolution. The most important scanner innovation was made by Kuhl and Edwards at the University of Pennsylvania. From 1960 and 1964 they developed and demonstrated clinically useful tomographic images (longitudinal and transverse sections). Their device predated by 9 years the development of X-ray Computed Tomography. They developed their own electronics, and a heavy duty gantry for holding and moving a large dual headed scanner that just fit into a standard sized imaging room. Image formation used simple first order back projection methods to display brain images that were superior in fidelity to any previously collected . Their work laid the ground work for Hounsfield and Cormack’s work for which they received the Nobel Prize for X-Ray tomography. The award was largely for the more advanced image reconstruction methods that they had adapted from prior astrophysics work. In the following years, Kuhl developed a series of specialized brain-only transverse section imaging instruments using an improved multi-detector gantry. The improved cross sectional brain images allowed the reliable differentiation of brain tumors from stroke lesions. Industry failed to market the device as they were not convinced that special purpose dedicated devices would sell As time proceeded, they proved wrong and specialized brain and heart imaging devices emerged and now are used for breast and heart imaging applications. The commercial success of X-ray computed tomography changed the instrumentation picture enormously. It showed Industry that a device that was clinically useful and accomplished important tasks could be sold despite their high cost. This lesson carried over to Magnetic Resonance Imaging (MRI), and the increasingly complex modern clinical gamma-ray imaging devices (PET/CT, and PET/SPECT, hybrid nuclear imaging systems). It turns out that high cost devices will sell if they do something worthwhile that provides patient benefit that can not be accomplished as well or as cheaply otherwise. Robert Beck and the Argonne Cancer Research Hospital group developed a 4 crystal scanner (ACRH Scanner), optimized for imaging 99mTc. Its use was modeled on the Kuhl device and ushered in a new generation of devices that took advantage of new applications using the new 140 keV emitting tracer that energized a a new spurt in clinical nuclear medicine. The most commonly used gamma-emitting tracer used before 99mTc was reactor-produced 131I, which also emits a number of energetic beta rays. To keep radiation doses acceptably low, only small amounts of 131I could be administered safely for diagnostic studies as it included long-lived (> 5-8 day) beta/gamma emitting tracers. To efficiently stop high energy gamma rays from 131I required thick 1″-2″ crystals and large 3”, 5”, and 8” diameter NaI (Tl) crystals came into use in later years. The lead multihole collimators used with the 8″ diameter detectors produced broad hour-glass shaped response profiles, with best resolution at the focal point. The smaller diameter 2″, 3″, and 5″ collimated detectors had narrower ellipse shaped response profiles that provided more depth independent response profiles as were best used for cross sectional tomographic imaging. George Taplin developed the largest diameter hemispherical detector system that focused at a sharply defined focal depth. It produced good images at the focal plane but suffered from severely blurred images from all other depths. Another major innovation in “scanners” was made by Anger when he developed the Pho Con, a Multiplane (longitudinal) tomographic scanning camera. The device included a dual opposed Anger camera with 1″ NaI and focused multichannel collimators that moved over the subject in a rectilinear raster. Its thick NaI crystal made it well suited for 131I and 67Ga imaging for which the device was used extensively in Europe. 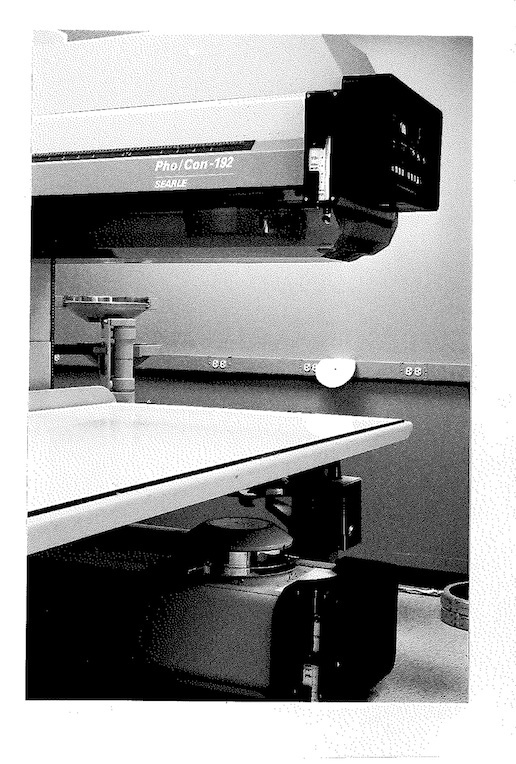 The thinner crystal in standard gamma cameras made better 99mTc images and the Pho-Con was never widely used in the USA. The PhoCon produced 6 images at different depths in the body as recorded by optical lenses on film. At Vanderbilt, Jon Erickson later coupled the PhoCon, to a PDP/9 and David Pickens wrote computer programs to display user-defined images at multiple levels and angles. A great deal of work was done to optimize collimators for camera-based imaging systems. Camera systems typically employ parallel-hole collimators, where hole size, septal thickness and collimator length are designed based on a trade-off between the desired spatial resolution (at appropriate distances), and sensitivity at the energy range to be used. Similar decision rules are used for the design of slant hole, converging, multi and single pinhole collimators. Collimator design improvements were based on new analytical formulations, results of Monte Carlo simulations, and new fabrication methods. Anger’s Mark II whole body scanner consisted of an array of 64 NaI detectors with a single bank of focused collimators below the subject. Hal Oscar Anger (May 20, 1920 – October 31, 2005) was an electrical engineer and biophysicist at Donner Laboratory, University of California, Berkeley, known for his invention of the Anger camera. The patient was moved over the detector array and the whole body of the patient was imaged in a matter of several minutes. Ostertag (DKFZ, Heidelberg) subsequently extended the design to permit whole body positron imaging by the addition of an upper bank of detectors operated in coincidence with the opposed crystal array. The efficiency of positron and gamma-ray imaging systems depends basically on the amount of scintillator and the system geometry. Stopping the 511 keV annihilation photons requires thicker crystals than are needed for low energy gamma imaging. The number, kind, and volume of the detectors, their geometric arrangement and the criteria for accepting a valid event, influence the relative sensitivity of the two methods. Using coincidence electronics, the DKFZ device produced whole-body emission (and transmission) images of annihilation photons with resolution needed for sequential dosimetry and slow dynamic studies. Muehllehner invented a rotational slant hole collimator fitted onto a stationary detector which produced dynamic information at multiple depths. It depended on reconstruction algorithms to separate activity from over lapping planes viewed by the rotating collimator. The limitation of the rotational collimator system was artifacts due to the use of the relatively simple reconstruction methods in use at that time. In the United States, Harper and Beck translated a person through the field of view of the gamma camera and moved the optics of the photo readout accordingly to produce the first gamma camera whole body scans. Ron Jaszczak and John Keyes rotated gamma cameras around the patient to produce transverse section images. Les Rogers and the Michigan group used multiple discrete small cameras around the patient with time coded apertures to create transverse section images. image Sebastian Genna developed a cylindrical NaI camera system using a rotating aperture plate for brain and potentially for breast imaging. Many early camera developments were made by Nuclear Chicago, and its successor organizations by a cadre of their early scientists (Jaszczak and Muehllehner in particular). Subsequently, GE, Picker, Siemens, Philips, El Scint, Toshiba, Hitachi, and a few other companies produced their own commercial gamma camera-based systems. Many of the important imaging developments evolved in Europe and Asia, and these were presented in the series of IAEA Symposia starting with the 1959 Athens meeting. Some, such as IAEA Quantitative Nuclear Medicine Imaging are available but unfortunately, the earlier publications are not available in digital format, but may be available for purchase from IAEA. ORAU sponsored a series of meetings starting in 1962 that brought together scientists from many countries that helped define and advance the state of the art. They too are not available digitally, but the titles of the papers in the series can be seen by clicking OAK Ridge Conf listings, and the books can probably be located and purchased on line. Positron-emitting radionuclides are mostly cyclotron-produced and the tracers short-lived, and hence early applications were limited to places with on-site cyclotrons. Longer-lived positron-emitters and generator-produced PET tracers were developed and used at off-site centers. The scanner mode of operation was limited to imaging static, or very slow dynamic, processes. During the 1950s, it was appreciated that mapping the static distribution of positron-emitting tracers could have a significant role for detecting and visualizing the extent of brain tumors in patients. The advantage over single-photon imaging was due to the better tumor-to-background ratio associated with the high tumor avidity of the positron-emitting radiopharmaceuticals they used. Much of the early work used tracers with several-day half-lives for brain-tumor imaging. Initial studies using 74As (17.5 d) and 64Cu (12.8 h) tracers produced high-contrast diagnostic images , and enthusiasm was high for their further development and use. Stationary pairs of opposed non imaging counting probes were used by the West and Dollery at the Hammersmith to map regional transients of respired gases. Kinetics of 15O, 13NO , 11CO2 and 12C15O2 gases were measured in the upper, middle and lower thirds of the human lung in the field of view of the opposed detectors. Much of the modern knowledge of pulmonary physiology, pulmonary blood flow and gas exchange was derived from these pioneering studies. Major PET imaging systems advances have been made since the early dual opposed scanners. The first of the modern line of devices was the hemispherical detector system developed by Robertson at the Brookhaven National Lab (BNL). in 1960. Mathematical tools for reconstructing the data were investigated by Bob Marr at BNL, but successful clinical application awaited Lucas Yamamoto and ChrisThompson at the Montreal Neurological Institute. They collapsed the design to a single ring cylindrical array and used the modified device in a long series of important neurological studies. Mike Ter-Pogosian, Ed Hoffman, Nizar Mullani and Mike Phelps at Washington University (WU) worked with the WU Biomedical Computing Lab facility to develop a series of cylindrical ring Positron Emission Tomography (PET) systems which are still the typical clinical configuration. Brownell at MGH/MIT developed a series of innovative PET imaging devices. The first was a large area dual opposed planar array. Its large area made it uniquely suited for pulmonary imaging. With the exception of illustrative studies in the 1970s by the MGH group (Brownell and Hoop) little 3-or 4-D imaging of lung function was performed to expand on the earlier probe-based results by West and Dollery in the UK. The lack of a large-field-of-view commercial ring based positron-imaging device delayed the further development of pulmonary imaging for many years, until today when important work is being done with large field of view detectors in conjunction with radiation oncology treatment applications. Brownell developed advanced coding schemes to reduce the component cost, much as done by Bender and Blau on the Autofluoroscope. Brownell and Burnham also developed a cylindrical array system following Z H Cho, but using novel coded detector arrays. Clever segmentation and packaging of BGO, NaI, LSO, YAP, GSO scintillator blocks are being effectively used in modern systems to decode x y z events with new crystal modifications and electronic tools. In order to over come distortion particularly at the outer regions of the body, clever means of encoding depth of interaction is now being used. These include the use of opposed arrays of avalanche photo diodes (APDs) to decoding wave form shapes from different elements in multi level (4x4x4) blocks, and advanced forms of Phoswich detectors. Earlier, Allemand and the Grenoble group developed the first time of flight (TOF) system using BaF2, because of its fast scintillation properties. Newer LaBr2 crystals show promise and are being used for TOF. Bill Dunn, a graduate student at Vanderbilt in the early 1970s used NE-111, a fast low efficiency plastic scintillator coupled to a pair of RCA experimental phototubes. The 250 ps uncertainty he achieved was state of the art but the number of detector pairs needed to populate a full ring geometry was thought to be too large, the detectors too inefficient, and the cost too high, and the work did not proceed further. Since that time, fast higher stopping power scintillators became available, and TOF PET is now a commercially marketed clinically useful device. Its advantage turns out to be primarily in very obese patients, where the fractional uncertainty in positioning of each event is a small fraction of the patient’s girth.